Law Minister Veerappa Moily is planning to put before the Parliament of India the Commercial Division of High Courts Bill, 2009 for its approval. This is a crucial piece of legislation as it intends to provide a quick and effective commercial disputes resolution mechanism. The Bill aims at establishing special courts for speedy hearing of commercial disputes of Rs five crores and above. Commercial disputes require immediate and appropriate dispute resolution to retain faith of business and commercial community in the dispute resolution machinery. India has not been a preferred destination for commercial disputes resolution due to inadequate commercial dispute resolution machinery. India needs to strengthen its alternative dispute resolution (ADR) mechanism as well as online dispute resolution (ODR) mechanism to inculcate confidence among the business community. Similarly, the Arbitration and Conciliation Act, 1996 must also be suitable amended to incorporate necessary provisions regarding ODR and e-courts. 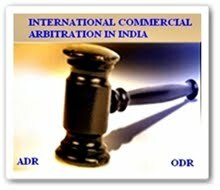 The present arbitration law of India is not adequate for ad hoc as well as institutionalised arbitration. It is also not effective for international commercial arbitration as well. Moily is planning to bring suitable amendments in the arbitration law of India. With this we can hope that India may get its deserving share of ad hoc and institutionalised arbitration and commercial dispute resolution services. Labels: ADR in India, ALTERNATIVE DISPUTE RESOLUTION IN INDIA, E-COURTS IN INDIA, ODR IN INDIA, ONLINE DISPUTE RESOLUTION IN INDIA, VEERAPPA MOILY.